Martin Brodeur, playing for the New Jersey Devils, salutes the fans while leaving the ice following a 3-2 victory over the Boston Bruins on April 13, 2014, in Newark, New Jersey. St. Louis Blues goaltender Martin Brodeur, who retired Tuesday, is a sure first-ballot Hall of Famer, having backstopped the New Jersey Devils to three Stanley Cups while setting the all-time record for most goaltending victories. He was also arguably the best puck-handling goaltender ever, inspiring subsequent goalies to leave the crease so often the NHL instituted new rules to curtail the activity. In the mainstream view, Brodeur’s legacy will be that of the consummate winner and innovator. Brodeur’s statistical legacy, however, has always been more complicated. Although he excelled in traditional goaltending categories like wins and goals-against average, his career also coincided with the advent of more sophisticated hockey analysis. For instance, Brodeur led the NHL in wins nine times, and finished in the top five on five other occasions — but suddenly it made less sense to credit the goaltender for the entire quality of his team. 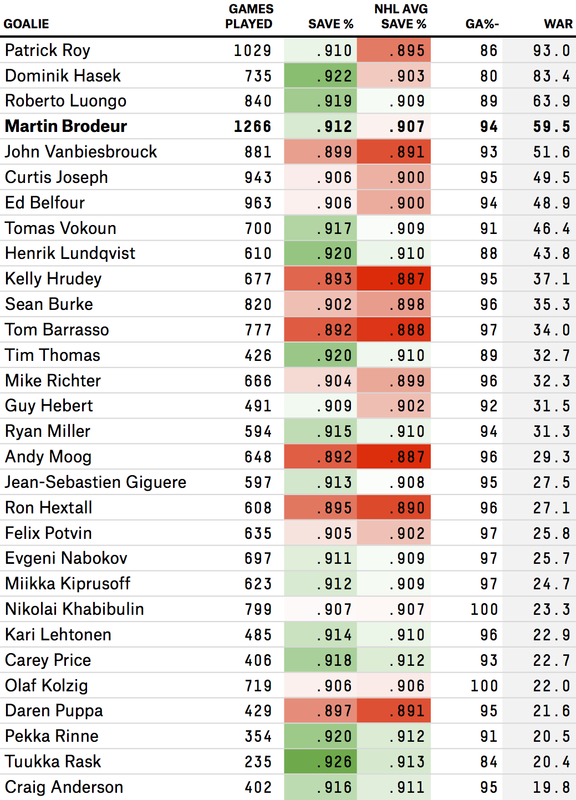 Brodeur had the second-lowest goals-against average of his era, but that number needed to be adjusted for the quality of his defenders (he faced the league’s second-lowest rate of shots per minute). And all that fancy puck-handling? Turns out it barely matters, if at all. One of the first analytical hockey blogs I can remember was called “Brodeur Is A Fraud.” Clickbait-y title? Sure. But behind it was a crusade for statistical thinking that mirrored the early efforts of sabermetricians in baseball. Brodeur took on outsize importance to the author (eventually revealed to be a Canadian accountant named Philip Myrland) because he was symbolic, a stand-in for all of the players overrated by traditional numbers. Brodeur was the flashpoint where conventional wisdom abutted hockey’s burgeoning analytics movement. So, with the benefit of further statistical advances, where does Brodeur stand? According to Tom Tango’s wins above replacement (WAR) method, Brodeur rates as the fourth-most valuable goalie since 1983-84, when the league officially began tracking save percentage. A lot of that is attributable to Brodeur’s durability. As Cam Charron wrote, Brodeur wasn’t a whole lot better than average at stopping pucks on a per-shot basis, but he did it for an extremely long time. Brodeur has 59.5 career WAR; a completely average goalie would have posted almost exactly half that — 30.0 WAR (which itself would rank 17th since 1984) — if he’d played as much as Brodeur did. By comparison, a league-average net-minder would have just 28 percent of Patrick Roy’s WAR total, and 23 percent of Dominik Hasek’s, if he matched their playing time. This is not necessarily a knock on Brodeur. Perhaps more advanced metrics don’t view him as favorably as his high win total seems to warrant, but they also recognize the long-term value of consistent quality (he was above-average every season but two between 1993-94 and 2009-10) at a position where excellence is so difficult to maintain.